Casa Emerald Palms is committed to providing an upscale, tropical ambiance where positive vacation memories are made. This include accommodations that are comfortable, clean, safe and fully equipped. The following terms and conditions govern rentals booked directly at Casa Emerald Palms under www.casaemeraldpalmscr.com as of March 2018. For simplicity, the term “Agency” refers to Emerald Palms Vacation Rentals (i.e. EPVR). EPVR acts solely as the booking and reservation agent for all short term rentals at Casa Emerald Palms or within Costa Rica as representatives of the property “Owner(s)” or the Owner(s) authorized representatives and successors. The terms ‘Property Management & Concierge Team’, ‘Property Manager’, ‘Concierge Manager’, ‘Property Management & Concierge Firm’ and/or ‘Property Management Firm’ refer to either the Agency or any local, Costa Rican Property Management companies used, hired or contracted by the Agency at Casa Emerald Palms. The Property Management & Concierge Team may also include their staff or contractors. The term “Primary Rental Guest” refers to the individual who initiates the booking or reservation with Emerald Properties Vacation Rentals. The term ‘short-term’ is defined as any rental that is less than 6 consecutive months in duration. Casa Emerald Palms may also referred herein as the “property” or ‘rented premises’ or as the ‘rented condo unit within a condo complex’. Your scheduled arrival date is considered your ‘Check in’ date. The last date of your reservation is called your ‘Check out’ date. Check-in and Check-out dates are subject to specific check-in and check-out times. Please see below for details. Any unauthorized early arrivals or late departures will result in a fee of $20 USD. Our change-over and cleaning schedules are based on arrival time of 2 pm and it can be disruptive to our Property Management and their housekeeping crew when Guests arrive early unannounced or depart late. Exceptions may be made in advance or when we don’t have Guests arriving or departing on the same day, just ask! Emerald Properties Vacation Rentals reserves the right to cancel any reservation if full payment is not received by the required due date. • The remaining balance is due no later than 30 days prior to the Guest’s scheduled arrival. Proof of Guest ID is required for (all persons 18 yrs and older). All reservations payments require a valid credit card in the name of the Primary Rental Guest initiating the reservation. The person making the reservation must be at least 25 yrs of age. The Agency requires all Guests to process their reservation payment(s) and any ancilliary guest service charges by credit card via PayPal. Paypal is a secure payment gateway used globally. The Agency may grant select Guests the opportunity to process their reservation payments by email money transfer (i.e. e-transfer) or via bank debit using PayPal. All charges and fees are in USD currency. As a Guest of Casa Emerald Palms, ancillary concierge or ‘guest services’ is available to you during your stay. These services are optional and are provided on a ‘first come, first serve’ or ‘best-available’ basis. Should you agree to participate or use any of these optional services, full payment is required upon reservation request and is non-refundable. In the event that it is found that the accommodation incurred careless damage, requires excessive cleaning, or has missing items, the Primary Rental Guest acknowledges and agrees his/her credit card will be debited to replace said items at the fair market price less the security damage fee collected, invoices will be provided if necessary. Any Guest who contravenes specific clauses within the terms and conditons set out herein shall be subject to paying additional fines or penalties. The nature and amount of the penalty is specific to the breached rental term or clause. The Primary Rental Guest agrees and acknowledges that his/her credit card on file will be charged accordingly with an electronic invoice provided for all such penalties or charges outside of a requested rental reservation or ancilliary guest service. No reimbursement of fees paid. Upon Agency/Owner discretion, security deposit fees may be reimbursed less $150 cancellation and applicable payment processing fees 50% of the reservation or advance monies paid reimbursed less $150 cancellation and applicable payment processing fees. Upon Agency/Owner discretion, security deposit fees may be reimbursed 75% of the reservation or advance monies paid reimbursed less $150 cancellation and applicable payment processing fees. Upon Agency/Owner discretion, security deposit fees may be reimbursed 100% of the reservation fee or advance monies paid reimbursed less $150 cancellation and applicable payment processing fees. • If there is a cancellation request or ‘no-show’ within 30 days of the Guest’s anticipated Check-in date, all funds collected is non-refundable. The Agency and/or Property Management will endeavor to re-rent the property for the same dates the Guest originally reserved. It is the sole discretion of the Agency and/or its assigned agents to advertise a last-minute pricing strategy in order to fill vacancies. It is not guaranteed by the Agency or Property Management and/or its assigned agents that the property will be successfully re-rented. Excessive noise between 9:00 pm and 7 am is prohibited. This pertains to loud music or sounds coming from the rented premises. We ask all Guests to be mindful and respectful of the neighbours as Casa Emerald Palms is located in a quiet, residential community. If local law enforcement, security company and/or the Property/Concierge Manager is called due to Guests (or their unauthorized visitors – see below policy regarding visiting Guests) disturbing the peace we do reserve the right to terminate the rental agreement immediately. Any fines incurred by Guests of Casa Emerald Palms or the Owners will be invoiced and paid by the Guest within 7 business days. Emerald Properties Vacation Rentals and/or its Owners/Property Management are not responsible for damages to Guest(s) personal property resulting from lightning, rain, flood, earthquake or other natural disasters. No refunds are provided to a Guest if such events occur. Each property has evacuation information (contained in the Guest book at the property), flashlights and emergency lighting in the unlikely event of an emergency. We encourage all Guest(s) to purchase travel insurance. The Guest(s) acknowledge that they will be responsible for and pay any damages done by rain, wind, hurricanes, etc. ONLY IF this damage is caused by negligence of the Renter(s). Examples include leaving the windows open, allowing overflow of waters, etc. In the event that the Agency or Property Management finds the rented premises incurred careless damage, requires excessive cleaning, or has missing items as a result of the Renter(s) occupancy, the Guest(s) acknowledges and agrees to immediately pay the Agency/Owner the necessary costs and/or penalties. The Primary Rental Guest’s credit card will be debited accordingly. At this time, Casa Emerald Palms has a zero pet policy. Subsequent Guests may be affected by, or allergic to pet hair or dander. In the event we find evidence of pets on the premises and/or a Guest or Visitor of the Guest brings a pet without obtaining prior written authorization, a 25% surcharge on the total cost of the reservation will be charged and applied to applicable cleaning fees. This surcharge includes, but is not limited to rug, upholstery and drapery cleaning to restore the home to a pet-free environment. By booking with us, you authorize the Agency, Owners and/or Property Management to charge the credit card we have on file and you will be notified within 48 hours of your departure or first notification of a pet within the rental premises. The Agency, Owners and/or Property Management Firm also reserves the right to terminate the rental agreement immediately without refund. Guests are reminded to advise all members of their traveling party and visitors of this policy. We will be happy to refer you to other trusted rental companies that allow pets at their vacation homes. Our vacation rental at Casa Emerald Palms is a SMOKE-FREE facility. This includes both the interior and exterior spaces associated with the condo unit. In the event we should find evidence or be notified of smoking on the premises during Guest stay, the reservation will be immediately cancelled with all payments and security deposits forfeited. Any extra man-hours required for removal of discarded cigarettes, trash or charcoal at Casa Emerald Palms (including exterior spaces associated with the unit or within the complex) will also incur an extra $100 USD per week minimum extra cleaning charge. Please inform all members of your traveling party and other Visitors of this policy during your stay. We encourage smokers to enjoy their cigarettes/cigars/e-cigarettes, etc (of all kinds and types) outside by the pool or while taking a stroll through the beautiful neighbourhood. In the event of neighbouring or on-site construction or maintenance, Emerald Properties Vacation Rentals, the Owners and/or Property Management shall not be held responsible for failing to provide Guests with any type of advance notification regarding construction and maintenance work in the area or within the condo complex. The Agency, Owners and/or Property Management do not always receive advance notification of new or ongoing construction/maintenance projects from either the local or regional municipality, the condominium complex’s property management Firm, Developers or from other Property Owners in the complex (new construction, exterior or interior renovations, pool/landscaping installation, etc…). In the event of circumstances beyond our control, the Agency, Owner and/or Property Management Firm reserves the right to substitute the accommodation for an equal property or upgrade, if necessary. If this were to happen, i.e. an accidental double booking or property is for sale and sells prior to your reservation, we would inform you of any change made to your reservation as soon as possible and prior to you arriving for your vacation. We care about your comfort and want to provide a safe clean environment for your stay. To accomplish this pest control is carried out at the rented premises up to four times a year. During Guest stay, the Agency, Owners and/or Property Management discourage Guests from leaving the backyard door, front sliding door and/or window screens open to attract unwanted pests, reptiles or insects from entering the premises. Costa Rica is a bio-diverse country with many species of harmless and poisonous creatures! Common sense is always recommended before attempting to handle any reptile or pest. In keeping with sustainable best practices, the Agency imposes a $85/week electricity usage cap. The Agency and Property Management Firm ask all Guests to be mindful of their energy use and limit energy consumption during their stay and when the rented premise is vacant. This includes Guest use of air conditioning, electricity and water. All Guest(s) agree NOT to pour any debris, grease, paper towels, Q-tips, tampons, condoms, sanitary napkins, newspaper or food in the sink drain or use excessive amount of toilet paper that may result in a clogged toilet or drain pipe. Should the Agency be notified of or discover a clogged drain pipe resulting from Guest(s) or their Visitor(s) usage, the Primary Rental Guest agree to pay the entire amount for all sewer-cleaning services resulting from clogged pipes. In order to provide a comfortable environment, hot water, electricity and air conditioning (AC) is provided at Casa Emerald Palms and regular maintenance or inspections are carried out up to four times a year. All Guest(s) acknowledge that the Agency, Property Management or their designates may enter the premises at reasonable times, with or without notice, for the purpose of making repairs and inspections. Guest(s) may also be required to provide hired maintenance personnel access in order for the property to be properly serviced if there is a malfunction during Guest stay. In order to provide a clean and safe environment, both the lawn and pool areas are regularly maintained by local maintenance firms hired or contracted by the condo complex. All Guest(s) are required to provide these firms access to serviceable areas and may not impede or block the maintenance company or crew from carrying out the work required. Should there be an interim maintenance disruption towards use of the lawn or pool, the Agency, Owner and/or Property Manager will communicate this information to you as quickly as possible and up to twenty-four (24) hours or more in advance to help you plan your stay. Glass is prohibited around the pool. Casa Emerald Palms offers pool-ready dining and serverware (i.e. plastic wine, drinking glasses, plates etc.) for use around the pool area. All Guests and their visitors agree to comply with local condo complex bylaws in effect while staying at the rented premises. A copy of all current condo complex rules & by-laws are found in the Guest Book conveniently located at Casa Emerald Palms. All Guest(s) and their Visitor(s) acknowledge that the complex swimming pool does NOT have a lifeguard on duty. All Guest(s) and their Visitors will exercise personal care while in and around the pool area. While fresh linens and towels are provided at Casa Emerald Palms prior to your stay, daily housekeeping services are not included in the advertised rental rates. Should you require housekeeping services during your stay, it is available at an additional cost and can be booked via your assigned Concierge Manager. Your total booking fee includes a mandatory $40 departure cleaning fee. We ask all Guests to remove any leftover food purchased or prepared during their stay from the fridge or freezer; to dispose of all garbage and recycling; strip the beds and leave all soiled linens and towels in the provided laundry baskets. While Casa Emerald Palms is conveniently located on the ground floor there are uneven grades and steps to traverse while moving about the condo complex. As such, Casa Emerald Palms is not ADA-compliant. If a member of your traveling party has special needs, please inform us prior to or when making your reservation and we will be glad to assist in any way possible. Emerald Properties Vacation Rentals requires the primary renting Guest and owner of the credit card used, to be at least 25 years of age to book. As listed on the rental contract, the Primary Rental Guest must list all adults and children (under 16) staying in the rental accommodation at any time during their rental period. Emerald Properties Vacation Rentals does not allow persons under 25 to occupy a vacation rental property unless accompanied by someone over 25 years of age. Additional verification (i.e. proof of government-issued ID) may be requested prior to finalizing your reservation. Any reservation obtained under false pretense will result in forfeiture of all advance monies, security deposit and/or full rental amount. The Guests will not be allowed to check-in. False pretenses include, but is not limited to Guests providing false names or ages, omitting the names of anyone staying overnight at the rental, or any other material fact that would normally cause the rental reservation request to be refused. Due to property size and safety considerations, the maximum number of Guests permitted to stay at Casa Emerald Palms is four (4) persons, including babies and toddlers. The Agency also reserves the right to restrict all rental reservations to a max of two (2) kids (aged 0 to 16 years of age) per Guest reservation. All Guests are asked to respect the maximum occupancy limit of Casa Emerald Palms. Additional persons occupying the propery are only permitted in writing by prior approval of the Agency and/or payment of applicable extra Guest charges or fees. Should the Agency, Owners and Property Management be notified of or discover unauthorized Guests inhabiting the rental premises, ALL parties will be asked to vacate the premises immediately. The rental contract will be termination and Guest(s) acknowledge the Agency will retain all funds paid, including the security deposit. There will be NO refunds issued for unused dates. 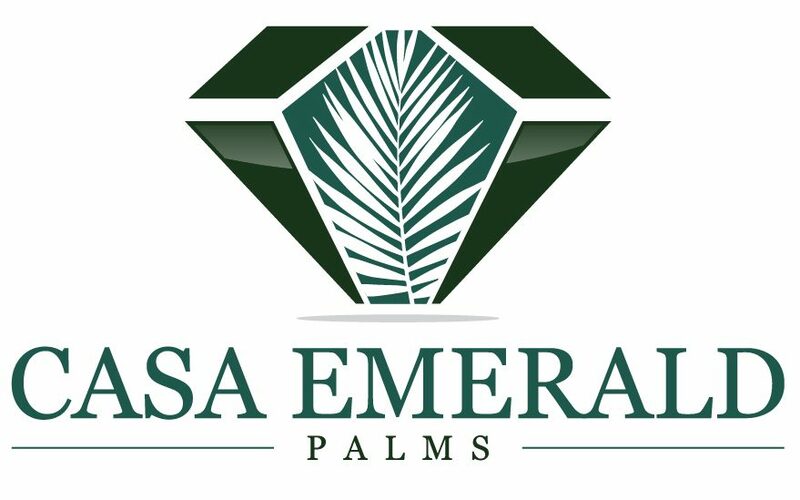 The Agency, Owners and Property Management of Casa Emerald Palms reserves the right to limit the number of and frequency of Visitors during any rental Guest reservation, at any time. The rental Guest may entertain a maximum of 4 visiting day guests. Each unapproved or excessive day Guest is a $75/per day fine regardless of the timeframe spent on the premises. Unapproved overnight Guests results in a 25% per person surcharge of the total cost of the reservation. Any exceptions to the above must be approved in advance and in writing by the Agency, Owners and/or Property Management firm. All Guests are provided with keys to the rented premises at Check-in from their Concierge Manager. It is the responsibility of the Guest(s) to safeguard the keys to the rental premises and all remotes for provided electronic gadgets. ‘Check-in’ will normally take place at the rented premises. Guest(s) agree to pay the cost for lost house keys, light switch and electronic gadget remotes, or other similar items. If keys or remotes are lost, the Primary Rental Guest(s) will be charged the replacement costs (e.g. change the locks). The replacement costs will be charged to your credit card following your departure and subsequent inspection of Casa Emerald Palms. Upon departure, please double check to make sure all of these items are left where you found them. The Owners and Property Management of Casa Emerald Palms make every effort to keep the rental premises and its equipment, including WI-FI in above-average condition and proper working order. In the event that any system, electronic device or appliance becomes inoperable, please notify your Property or Concierge Manager immediately. We will make every effort to repair or replace any inoperable system, device or appliance as soon as possible. All Guests expressly waives and relinquishes any rights or claims against the Agency, Owners, the rented premises, the Property or Concierge Manager and/or Property Management team for any damage that may result to the Guest(s) from lack of maintenance, cleanliness, repair, defect for ordinary negligence. There will be no refund of all or part of the rental amount for any operational failure of an electronic device, appliance or equipment. In the event maintenance of a device, equipment or appliance is required during your stay our service contractors may require access to the rented premises, with or without formal notice. Please note that in the event of a power outage, electric storm or any other circumstance that WI-FI, television, Smart Home device and amenities may temporarily (or for the duration of your stay) be interrupted and does not warrant a refund or credit at any time. By booking with us, all Guest(s) agree and understand that random and unplanned regional utility restrictions (i.e. blackouts or brownouts) are common and can occur throughout Costa Rica. As such, the Agency, Owners and/or Property Management & Concierge Team cannot guarantee air conditioning, appliances, cable service, television, water availability and Internet will work 100% during Guest stay. Wi-Fi, Smart Home devices, Streaming services and satellite TV are provided as a convenience and are not integral to the license or use the property. No refunds shall be given for outages, content, lack of content, speed, access problems, lack of knowledge of use, or personal preferences with regard to services. All rental Guests and their visitors are prohibited from tampering with, altering or disconnecting any electronic Smart Home Device, Internet or TV product or service provided during their rental stay. We impose a weekly 12.5 Gb Internet data usage allowance. If you or your travelling companions exceed this limitation, you may be charged $20 USD for extra bandwidth capacity. To access the home’s secure Wi-Fi, please check in via our Facebook page at https://www.facebook.com/casaemeraldpalmscr/ or consult the guest book found at the property for details regarding the SSID and secure password. A part of the ‘smart home’ and safety features at Casa Emerald Palms, all Guest(s) acknowledge that the property has surveillence equipment on site. All security cameras point towards the entrance doors of the rental unit and are not intended to capture images or sounds from other areas of the property for your privacy and convenience. Emerald Properties Vacation Rentals, the Owners, Property Management & Concierge team and/or contractors shall not be held liable for items left behind at the rented premises. Please let us know as soon as possible, if any items were lost or left behind. We will make every effort to locate any items and help arrange for delivery back to you. If we find your items, we will notify you to make arrangements to return them to you and all Guests agree to pay an applicable shipping and handling cost. All Guests agree and understand the location of lost items may be delayed due to our ability to gain access to the property to look for said items. If the items are found the Agency, Owners, Property Management & Concierge Firm and/or contractors shall not be held liable for said ‘lost’ items in their possession until it can be safely delivered back to you. Rates are subject to change without notice on the website. Rates may differ from those advertised on OTA’s (Online Travel Agencies) or on social media channels. Confirmed booking rates will never be change unless directed by you, the paying Guest. Examples of possible Guest booking rate changes include additional reservation days added or auxiliary Guest services requested. The Agency, Owners and the Property Management/Concierge team of Casa Emerald Palms require that Guests report all damage or malfunctioning device or product supplied in the rental property immediately. Fire and water damage, and pest infestation will need immediate attention and evaluation to determine any additional health and safety risk. Guest(s) must report any problem or concerns with the property to their Concierge Manager as soon as possible. Guest(s) are also responsible for securing the rented premises during their stay. This includes locking all doors and windows whenever they leave the condo and at night. All Guest(s) are encouraged to lock their valuables in the provided electronic safe. Guest(s) shall use the rented premises for residential purposes only and in accordance with this rental agreement, all house rules, local municipality and condo association bylaws. No Guest is permitted to sublet or transfer this agreement without express written consent of the Agency. Guest(s) will take care to prevent any damage or loss to the Rented Premises and keep it clean and sanitary at all times. Professional cleaning fees will be charged to the Primary Rental Guest for spills and stains on the carpeting, bedding or furniture. Guest(s) will be charged for all broken or damaged items outside of normal wear and tear and for excess garbage left at Casa Emerald Palms following their departure. Casa Emerald Palms uses ‘smart’ home protection features and remote security surveillance at all times. This includes security video cameras (equipped with two-way radio communication) pointed at the exit doors (front and/or back doors) to the rented premises. All Guest(s) acknowledge that any surveillance equipment in use at the time of their rental is NOT intended to capture images or sounds from other areas of the property for your privacy and convenience. There is a WI-FI-enabled fire alarm installed in the rented premises. The Agency, Owners and/or Property Management Firm are automatically notified of any malfunction or offline activities with the device, which is part of the overall ‘smart’ home amenity available at Casa Emerald Palms. As such, the fire alarm is confirmed functional at the time of each Guest rental. Guests must notify the Property Manager without delay if a fire alarm “chirps” or has a low battery condition. The Agency and/or its Owners shall not be liable to Guest(s) or to any party for any type of issued violations, including but not limited to, parking tickets, noise complaints, and those mentioned within this rental agreement. The sole responsibility lies with the responsible party including any incurred fees or penalties. Any Guest who contravenes the terms of this rental agreement shall be subject to immediate eviction without refund and/or a penalty of $100.00 per day at the discretion of the Agency. The information provided during Guest booking and reservation, though deemed accurate, is not guaranteed. It is subject to errors, omissions, change of price or withdrawal without notice. Guest agrees that all personal property, furnishings, personal affects and other items brought into the property, by themselves, their traveling companions or other visitors shall be at the sole risk of the Guest with regard to any theft, damage, destruction, defects in the premises or other loss. You and your travelling companions (i.e. the Guest(s)) represent, warrants, acknowledge and agrees with Emerald Properties Vacation Rentals (i.e. the Agency), Owners (i.e. the Property Owners of Casa Emerald Palms), and the Property Management Company (i.e. the Property Management and Concierge team) that you will use the vacation rental known as Casa Emerald Palms and its facilities in accordance with the terms and conditions of this agreement and the house rules and that you do so at your own risk and that you indemnify and save the Agency and Property Owner, Property Management Company and any of their authorized agents, successors, heirs employees or contractors harmless from any claim made as a result of personal injury, sickness or death, loss or damage, however caused, to person or property of the Guest or their family, guests, visitors, servants and agents during or after the time of occupancy or about the complex where the rental property resides. Further, all Guests accept full responsibility of the use of any recreational equipment provided at Casa Emerald Palms, such as Amazon Alexa, TV, DVD/Blue-Ray Player, Bluetooth sound system, life jackets, golf carts, etc. and agrees to pay for any repairs to damage to or replacement of said equipment, if caused by the Guest, their travelling companions, visitors, servants and agents. The parties (i.e. Guests, Owners, Contractors, Property Management Firm, Agency) agree that this agreement shall be governed and enforced according to the laws in the Province of Ontario, Canada and Costa Rica. The parties agree to attorn solely to the jurisdiction of the courts of Ontario with respect to any and all disputes arising out of the interpretation and application of this contract and the relationship between Casa Emerald Palms, Emerald Properties Vacation Rental, and its Guests. This agreement contains the entire agreement of the parties. It may not be changed orally, but only by an agreement in writing signed by the party against who enforcement of any waiver, change, modification, extension or discharge is sought. Renters cannot assign or transfer this agreement.